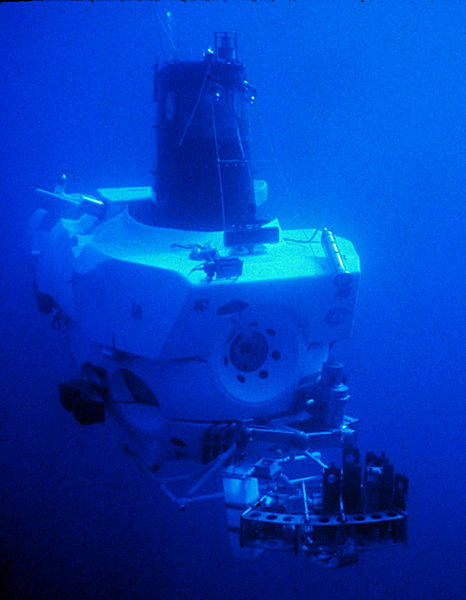 When the deepsea research submersible Alvin was commissioned in 1964, undersea exploration carried a strong flavor of direct human exploration. That summer as Alvin made its first dives, the U.S. Navy also launched its Sealab I underwater habit, a successful pioneer in saturation diving. Sealab I has long been a museum piece. But Alvin, still owned by the Navy and operated by the Woods Hole Oceanographic Institution (WHOI), keeps going. The first half of its career, which received the most public attention, is nicely summarized in Water Baby by Victoria Kaharl (a classmate of mine at journalism school). In 1966, the sub made the world a tad less worrying by finding a hydrogen bomb that had sunk to the bottom of the Mediterranean, and helping in the bomb’s recovery. But the sub’s greatest scientific contribution arguably came with its 1977 dives to warm-water seafloor vents more than 8,000 feet down off the Galapagos Islands. Scientists onboard watched clams living, well, as happily as clams, in an ecosystem built on chemosynthesis rather than photosynthesis. In 1986, the sub enjoyed its highest moment of popular fame in the first human visits to the wreck of the Titanic. Since then Alvin has mostly quietly plugged away, to a total of more than 4,600 dives. And it has become like an ax that has had two heads and seven handles. It has no original parts. Its most recent overhaul was a $41 million job completed last year, with a larger titanium sphere for the crew, better imaging equipment and other goodies. Over all these decades, oceanography has seen even more stunning advances in undersea unmanned research equipment, going beyond simple towed devices into highly sophisticated remotely operated vehicles (ROVs), autonomous underwater vehicles (AUVs), undersea gliders and a colorful collection of other specialized undersea beasts. These vehicles can not only go where no man has gone before, but where no manned submersible will ever go, for reasons of logistics and safety. Alvin is the last manned deepsea submersible in the U.S. fleet, and today’s tight National Science Foundation research budgets ensure that its role is under debate—most recently in a report released yesterday by the National Research Council. An expert group that included Don Walsh (who piloted the bathyscape Trieste to the bottom of the Mariana Trench in 1960) found that Alvin remains highly useful but not critical to the highest priorities for U.S. ocean science in the next decade. “This is due to the greatly increased capabilities and availability of ROVs, AUVs, and gliders,” the report says. Probably more importantly, the NRC report adds, Alvin’s dedicated support ship Atlantis, one of the last big research vessels left in the fleet, might be employed more profitably in other scientific projects. When Alvin eventually retires, probably quite a few years from now, the scientific and budget reasons will be solid. But we’ll regret the loss of opportunities of direct human witnessing to the unknown, like the one on that sunny day off the Galapagos in February 1977. We can picture Alvin’s original support ship Lulu (a funky catamaran built on two surplus minesweeping pontoons) trudging over to an area where a towed camera vehicle had reported a spike in water temperature and brought up photos of clam and mussel shells near the spike. Near daybreak, pilot Jack Donnelly joined geochemist Jack Corliss and geologist Tjeerd van Andel (there were no biologists on the cruise) and Alvin headed down. The three men could see that living clams surrounded the shimmering water where hot water poured up from the seafloor. And they could confirm the discovery that would change our understanding of life on earth. This entry was tagged ocean, oceanography, WHOI. Bookmark the permalink. Just happened upon this. Nice to see my father’s work celebrated. Thanks, Eric!